Home › Our Practitioners › William Schudlo, R.Kin., D.O.M.P., D.Sc.O., CAT(C), Hon.BA (Kin. ), BAHSc. William’s interest in physical rehabilitation arose during his undergraduate studies in York University’s Kinesiology and Health Science program from which he graduated with a Bachelor of Arts in 2004. 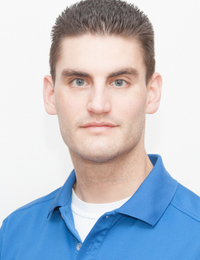 After graduating from Sheridan College’s Bachelor of Applied Health Sciences (Athletic Therapy) program in 2008, he successfully completed the Canadian Athletic Therapists Association certification exam and was granted the title Certified Athletic Therapist. Seeking to expand his clinical skills and expedite his patients’ recovery, William enrolled in the Traditional Osteopathy program at the Canadian College of Osteopathy. After completing the 5-year program of study and all comprehensive clinical examinations, he defended his thesis entitled “The Effect of Osteopathic Treatment of the Mandible on Upper Extremity Grip Strength” to the International Jury in 2016. In addition to receiving his Diploma in Osteopathy Manual Practice (D.O.M.P. ), he was also granted a Diploma in the Science of Osteopathy (D.Sc.O.). William is a member in good standing with the Ontario Association of Osteopathic Manual Practitioners (OAO), the College of Kinesiologists of Ontario (COKO), the Canadian Athletic Therapists Association (CATA), and the Ontario Athletic Therapists Association (OATA).